The United Nations, which failed to find a diplomatic solution to head off the assault, fears the fighting will cut off the only lifeline for most Yemenis. SANAA, Yemen — Saudi-led forces fought to retake the international airport of Yemen's rebel-held port city of Hodeida, Yemeni officials and witnesses said on Saturday, as their Shiite Houthi rebel rivals denied the coalition had seized the facility that is the starving nation's main gateway for food shipments. With battles raging at the southern side of Hodeida International Airport, the military of Yemen's exiled government said it had entirely seized the compound, and that engineers were working to clear mines from nearby areas just south of the city of some 600,000 people on the Red Sea. "The armed forces which are supported by the Arab coalition have freed Hodeida International Airport from the Houthi militias and the engineering teams have started to clear the airport and its surroundings from mines and bombs," the military said on its official Twitter account. Sadek Dawad, spokesman of the Republican Guards force loyal to the Saudi-led coalition, said government forces had battled their way onto the airport's grounds. "The military operations to liberate the city of Hodeida will not be stopped until we secure the city and its strategic port and that won't last too long," he told The Associated Press. Houthi-linked civil aviation authorities, however, denied that their rivals of the Saudi-led coalition and Yemeni forces have taken control of Hodeida's airport. A statement posted Saturday on the Houthis' official news agency, SABA, quoted Ahmed Taresh, the head of Hodeida airport, as adding that airstrikes have completely destroyed the airport. The Houthi-run Al Masirah satellite news channel aired footage it described as being from near Hodeida showing a burned-out truck, corpses of irregular fighters and a damaged Emirati armored vehicle. The Iranian-aligned fighters rifled through a military ledger from the vehicle before chanting their slogan: "Death to America, death to Israel, damn the Jews, victory to Islam!" The officials said that if government forces capture the Kilo 16 Road they will trap the rebels in Hodeida and the western coast and prevent them from receiving supplies from the capital. 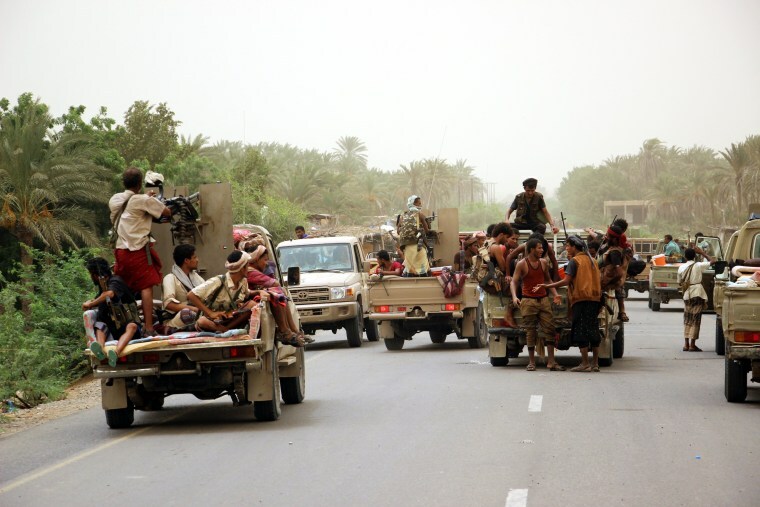 The rebels are then expected to have no choice but to head to the northern province of Hajjah. The Saudi-led coalition began its assault Wednesday on Hodeida, the main entry for food into a country already on the brink of famine. Emirati forces are leading ground forces mixed with their own troops, irregular militiamen and soldiers backing Yemen's exiled government. Saudi Arabia has provided air support, with targeting guidance and refueling coming from the U.S.
International aid groups and the U.N. cautioned the Saudi-led coalition from launching the assault. Their fear is that a protracted fight could force a shutdown of Hodeida's port at a time when a halt in aid risks tipping millions into starvation. Some 70 percent of Yemen's food enters via the port, as well as the bulk of humanitarian aid and fuel supplies. Around two-thirds of the country's population of 27 million relies on aid and 8.4 million are already at risk of starving. The World Health Organization expressed concern on Saturday over the fighting around Hodeida, calling for unbroken aid access and protection of health workers. In a statement Saturday, WHO Director-General Tedros Adhanom Ghebreyesus said "we stand with our U.N. partners to call on all parties to the conflict to protect the port, and allow its uninterrupted functioning. We also call on all parties to protect health workers and their facilities from harm, as well as to ensure unimpeded access for medical teams seeking to treat the wounded." For its part, the Saudi-led coalition says it had no choice but to launch the assault as the port provided millions of dollars for the Houthis through customs controls. They also accuse the Houthis of using the port to smuggle weapons through, something a U.N. panels of experts described in January as "unlikely" as incoming ships require U.N. permission and are subject to random searches. Aid agencies and the U.N. evacuated international staff from the city ahead of the offensive. Some of the wounded able to flee are driving onto Aden, some 195 miles (315 kilometers) away, after being stabilized at a hospital in Mocha on the way, the aid group Doctors Without Borders said. The local hospital in Hodeida already is struggling to help the wounded, the group said. "Families are trapped inside and it is difficult leaving as they are coming under airstrikes and bombardment by both parties of the war," relief worker Saber Wasel told The Associated Press. "It was a hard night for citizens because of the intensity of the strikes and gunfire." Security officials and witnesses said Saturday that Houthi rebels had also attacked government forces in al-Faza and al-Gah towns on the western coast over the past two days, killing at least 16 troops and wounding at least 13 others, and cut off the road that links between al-Gah and ad-Durayhimi district, some 12 miles (20 kilometers) south Hodeida's airport. The officials spoke on condition of anonymity because they were not authorized to brief media, and the witnesses for fear of reprisals.